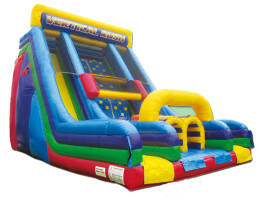 The Vertical Rush is the bounce house rental to rent for a true athletic display at your next party. Starting at the bottom, two guests are tasked with scaling the 22' wall. And once at the top, there is only one way to come down, and that is by sliding down.